Chandler City Hall is located at 175 South Arizona Avenue, Chandler, AZ 85225; phone: 480-782-2210. Chandler is located in Maricopa County, Arizona, about nine miles south of the Salt River and ten miles north of the Gila River. The city is situated on a broad alluvial plain at an elevation of 1,248 feet. The San Tan Mountains separate the Chandler agricultural district from Coolidge and Casa Grande to the south and east. The development of towns and cities in Arizona prior to 1920 generally occurred without reference to any overall plan. Towns sprang up as trading centers or to support nearby economic enterprises, and their forms evolved as an aggregate of the narrow needs and interests of the various property holders. The few instances where urban form was a major consideration in their development were exceptions to this pattern. Chandler, a "City Beautiful," is among these few. Doctor Alexander John Chandler, the first veterinary surgeon of the Territory of Arizona, envisioned a "City of Progress" that would be based on agriculture and tourism. In 1911 Dr. Chandler began to subdivide the 18,000 acres known as the Chandler Ranch. Unlike most Arizona cities, Dr. Chandler chose to comprehensively plan the new town of Chandler, following "City Beautiful" precedents. 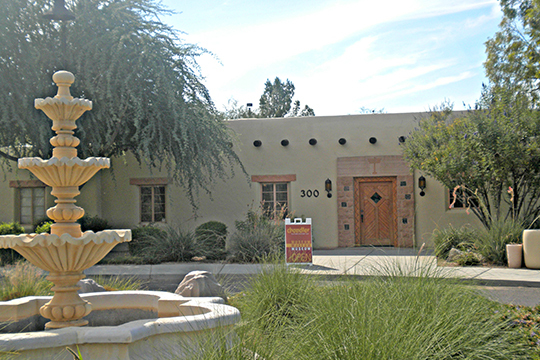 Dr. Chandler applied many of the City Beautiful concepts to the Chandler Town site established in 1912. The town of Chandler was a planned community designed by California architect Arthur B. Benton. The central town plaza is an obvious application of a City Beautiful concept. As originally conceived, Commonwealth Avenue bisected this central space dividing the rectangular park into two squares with diagonal walkways stretching from each corner. An open irrigation canal ran between the railroad station on the east side of the park and the cornerstone of Chandler, the San Marcos Hotel on the west side of the park. Following Frederick Law Olmstead's idea that parks enhance surrounding property values, the public and commercial buildings, along with the San Marcos and the Suhwaro hotels were placed around the plaza and connected by a colonnade. The plans for the plaza buildings were not completely executed and some of the buildings that were built no longer exist. Another obvious application of the City Beautiful Movement is the use of neighborhoods to divide the classes. Most of the working class or "blue collar" people lived to the southwest of the plaza. The wealthier class workers lived to the northeast in an area called "Silk Stocking Row," also known as the "Restricted Zone" because of its minimum residence construction cost of $3500.00. Many of the changes in Chandler have been indifferent to City Beautiful precepts. The changes have destroyed the original City Park and suburban Chandler has implemented "strip" development. The most severe change occurred in 1940 when Arizona Avenue was extended through the center of the plaza. This not only divided the park, it also established a significant barrier between the east and west sections of the downtown. In recent years large sections of the park have been paved for parking and landscape has been lost for an accentuated crosswalk with a pavilion on each side. A remnant of the open irrigation canal remains between the south side of the San Marcos hotel and Commonwealth Avenue; the rest has been covered. Although many of the original elements of the City Beautiful plan have been altered in Chandler, many of the original concepts remain in the original city center. Newer portions of the city and the outskirts of the downtown area do not follow the original vision. However, continuing the City Beautiful concept, modern public buildings have been placed on the plaza alongside the historic buildings. The plaza, known today as the A. J. Chandler Park, remains a dominant element even in its altered state. Most Arizona communities did not consider the design of the urban environment a high priority. Planning methods often consisted of a simple grid street pattern for easy development. Chandler was an exception to this rule, but City Beautiful aspects are evident in a few other Arizona towns and cities. Some parts of Phoenix reflect City Beautiful ideas. For instance, the Carnegie Library was sited in the center of a large park with pedestrian walkways. Washington Street, as a City Beautiful boulevard, terminated in front of the classically inspired State Capitol building. Phoenix's earlier neighborhoods also feature tree lawns lining the streets. Another example of the City Beautiful movements' influence in Arizona is Clarkdale, a small smelter town in central Arizona. Like Chandler, it was a planned community. The town of Clarkdale has a community park with major civic buildings surrounding the city center. Clarkdale was divided into neighborhoods for upper-class management, middle-class laborers, and segregated areas for ethnic minorities. On the other hand, most communities grew without benefit of a "master plan" to guide development to a more humane result. Planned communities, including Chandler, were the exception rather than the rule. As such, Chandler is one of the last examples of the influence of the City Beautiful movement on town planning in Arizona. The vision of Chandler's founder remains evident in the town to this day. Robert G. Graham, AIA, Architect and Douglas Kupel, Ph.D., Historian, Alliance Architects, L.L.C., Chandler Commercial Historic District, Maricopa County, AZ, nomination document, 1998, National Park Service, National Register of Historic Places, Washington, D.C.